Mohamed al-Azawi and his wife describe how Ramadan traditions have been affected by the ongoing conflict in Iraq. Before the US-led invasion and subsequent occupation of Iraq in 2003, Mohamed al-Azawi worked as a university professor in Baghdad. For security reasons, he was forced to leave his wife and children during the war. He relocated to Jordan, Syria, Bahrain and finally Doha, Qatar, where he has lived since 2010. Doha - "So you want to know about Ramadan in Iraq?" Mohamed says with a grin as he opens the door. The house is quiet. Mohamed lives on his own for most of the year, but his wife, Hayfaa, is here today on a rare visit from Baghdad. She smiles at her husband's enthusiasm. "I can only tell you about Ramadan up until the war, and I won't really be able to give you details about the food," Mohamed adds. "My wife will be much better at that part." Mohamed reaches for the remote control to lower the volume on the television, "so we won't get distracted". Hayfaa points out that he could turn it off entirely, but he jokes: "It's Iraqi tradition to leave the television on in the background." 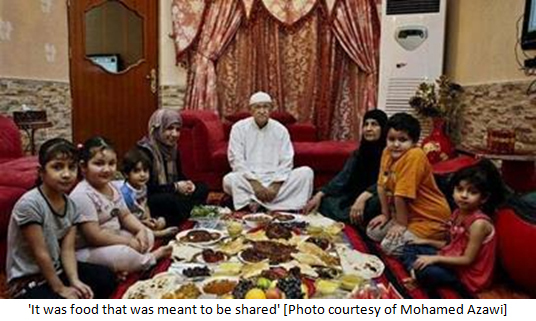 Mohamed spent his childhood in Baghdad, where the whole family would gather around the iftar dishes spread out on the floor of the family's home: kubbab (stuffed savoury dough), threed (a special rice dish) and mahalabiya (pudding). "When I was a little kid, we would take empty jars of jam, place candles inside them and carry them around like lanterns," Mohamed tells Al Jazeera. He also recalls children knocking on doors of local homes, asking for candy and sweets. Towards the end of the month, the children would excitedly wait for Eid. "We would prepare our Eid clothes during Ramadan and lay them out to wear the night before Eid," Mohamed says. "All of the kids went to carnivals, with rides and games, and of course we got our eidiyahs [money given to children during Eid]." While Mohamed left Iraq shortly after the 2003 invasion, his wife and four children remained in the country. "I left Baghdad right after the invasion started, so my memories are frozen in time," he says, noting he left amid death threats and targeted killings of hundreds of Iraqi intellectuals and academics during the war. 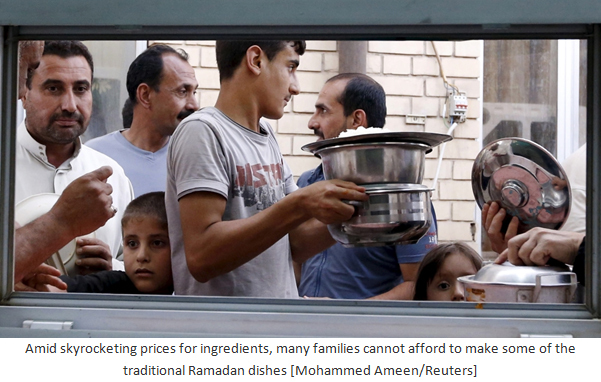 Ramadan traditions in Iraq are barely surviving the ongoing conflict, Hayfaa tells Al Jazeera. "I could tell you about how families used to come together, how the neighbourhood wives used to prepare their maamoul (sweets stuffed with dates) and kubbab together," she says. Hayfaa recalls how her family used to prepare so much food that they had to borrow large pots and pans from the bakeries down the street: "It was food that was meant to be shared." During the war, electricity was frequently cut for several hours a day, preventing families from cooking many of the traditional dishes. The Iraqi government also started to cut down on basic food rations given to families, removing everything but a low-quality rice "that smells like plastic when cooked", Hayfaa says. 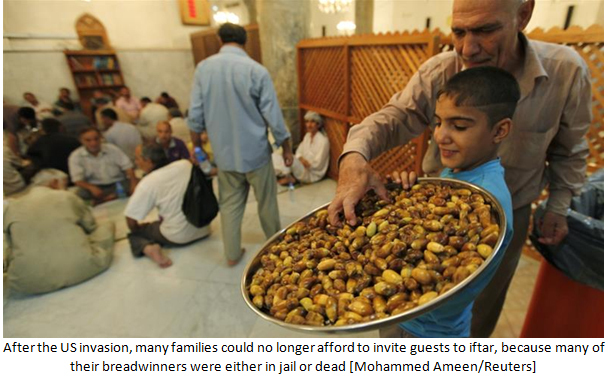 Families could not afford to invite guests anymore, because many of their breadwinners were either in jail or dead. "After the US invasion, you cannot really feel the happiness of Ramadan when you have family members missing, and most families cannot afford to invite others for iftar when their breadwinners are gone," Mohamed says. "[Family members] still unite for iftar, though. A spread would be laid out on the ground in the main sitting room and the family, young and old, men and women, eat together." One of the main dishes Hayfaa prepares in advance is kibbeh (a ball of dough stuffed with minced meat). It is placed in the freezer, so a little can be taken out and fried each day. "You know it is Ramadan in Baghdad 10 minutes before iftar, when you see the kids running from door to door with plates in their hands," Hayfaa says, smiling at the memory. "It was an endless stream of plates from different houses, that when it was time to send plates back, you could not tell which plate belonged to whom. Now, people can no longer afford to be so generous." Due to the lack of electricity, few people could see the announcement of the start of Ramadan on television, she says; instead, volunteers drove around neighbourhoods calling out, "Ramadan is tomorrow." Mosques also broadcast the phrase "Allahu Akbar" ("God is great") from their loudspeakers to welcome the start of the holy month. With a lack of power and unreliable freezers, families have been forced to "frantically prepare the kibbeh and cook it on the same day" - an exhausting process, Hayfaa confirms. "It is still Ramadan and we had to cook," she says quietly. But many other Ramadan traditions have died out amid the country's economic plight and unstable security situation, Mohamed says. "You could be on your way to a mosque or someone's house for iftar and a car bomb would go off," he notes. "There are constant disappearances too, so people are preoccupied with survival." Ramadan dishes require expensive ingredients, so many Iraqi families, impoverished by the war, can only afford to fry tomatoes and eggplants for iftar. Mohamed recalls a local Iraqi programme called Your Iftar Is On Us, in which the television crew would knock on the door of one of Baghdad's poorest families. "They take them to shop for food and other essentials. They would also bring over new household appliances. Then they end the episode by giving the family money to celebrate Eid and buy new clothes," Mohamed says with a smile. "It's a nice thing to see, especially with everything that's going on." Other Iraqis with disposable income also prepare food necessities to give to the poor during Ramadan. Another tradition that has survived is the muhabis (ring) game, in which men congregate in teams inside local cafes. A person from one team hides a ring in one of his palms, while the other team has to guess who has it. "Adult men play this, and it is an integral Ramadan tradition," Hayfaa says. "Several rounds are played, and the winning team is awarded a tower of sweets, either jalebi or baklava." 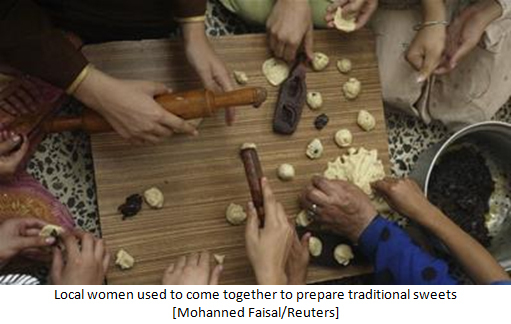 Before Eid, the women of the neighbourhood used to gather in one house to cook traditional klecha or kaak (circular sweets made of sesame and usually stuffed with date paste). Each woman would bring plates and different ingredients. "After it's prepared, we would take it to a baker down the street, so it could bake in one of their big ovens," Hayfaa recalls. There was a time during the siege imposed after the first Gulf War when sugar was severely rationed and almost all of the sweet shops had to shut down, Hayfaa says. "I took my sugar rations to bakers and traded them for lokum [Turkish delights] and other things in order to have something sweet during Ramadan." Back in Doha, Hayfaa goes into the kitchen and reemerges moments later, carrying a plate of kaak. Her husband absentmindedly picks one up and sets it on the table. He leans back on the couch and rubs his eyes. "Iraqis never really want to leave their country. It was unfathomable to migrate because there is no real settling outside of Iraq," he says. "I was in Bahrain for some time, and they have this dish that is similar to ours in Iraq. It is called harees [meat porridge], but we sprinkle some cinnamon and sugar on top." Mohamed laughs, looks around, and then sighs. "During one of the iftars, I asked my Bahraini host if I could have some cinnamon with the harees and he laughed," he recalls. "It is strange living so long outside of Baghdad."